The past week I started to put up my school bulletin board, but once I glued the final touches of my name in cut out fluorescent orange bubble letters I realized since I didn’t have access to a printer or any art supplies my job was put on hold there. Instead I focused on the beef of this month’s work: the jikoshoukai, my self introduction. Being that it’s what I’ll be doing for each class the first time I visit, and there are three years, and eight classes per year, I’ll be presenting my self introduction roughly 24 times. Except, due to sports day festival and silver week, there are only 14 days of class this month. In which case I’ll be performing my self introduction at least two times a day, each taking up roughly half an hour, meaning I’ll be spending at least half a day introducing myself, and the other half answering questions like: how tall are you? What do you want to do in Japan? and of course, do you have a girlfriend? So even though I got the layout of my presentation completed, I was still lacking in which photos to add and and even what software I would use. I was determined to finish it up over the weekend, but after waking up to a temperate and sunny Saturday morning I decided it could wait just a bit. Instead, I cleaned thoroughly for the first time, moving plenty of things around, sweeping the floors and organizing my closet. Really, it wasn’t much of a challenge since the only furniture I do have is a fold out futon mattress that goes into my closet. Still, it was nice to put things away and imagine what I’ll be doing come next paycheck. I keep going between a desk, chair, and monitor, or a couch; really, the conflict is do I create a space for myself to work and play, or a space for others to relax and socialize. For now, I’m leaning toward the latter, but also my lack of internet might be skewing what I’ll really want to have time for after a ten hour work day. Anyway once the place was clean, I pulled out my iPad where I’d downloaded those Japanese textbooks, and spent some time studying and waiting for one of my neighbors to wake up. 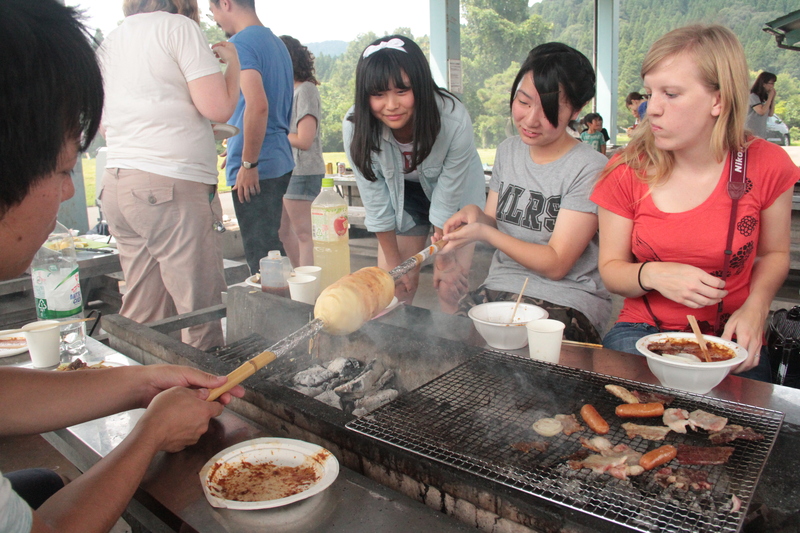 We had planned to drive to a nearby town where the local board of education and international club were hosting a yakitori at a local park. It’s weird to think that this was the last weekend I’d be having as part of summer vacation (especially since I’d been working most of the day for the past two weeks), but I really wanted to enjoy it. We got to the park a little after the barb-b-que had started, but were welcomed by the people there. 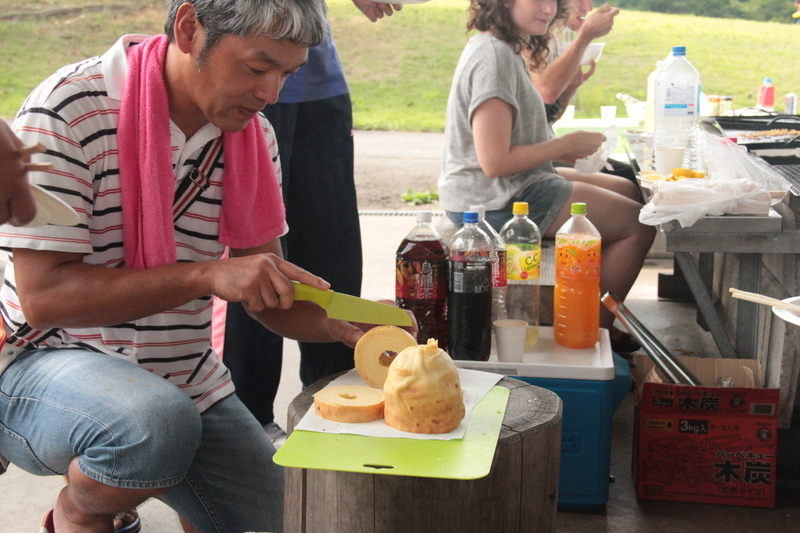 It was cool to see some of the ALTs we knew but also get introduced to a plenty of Japanese folk. 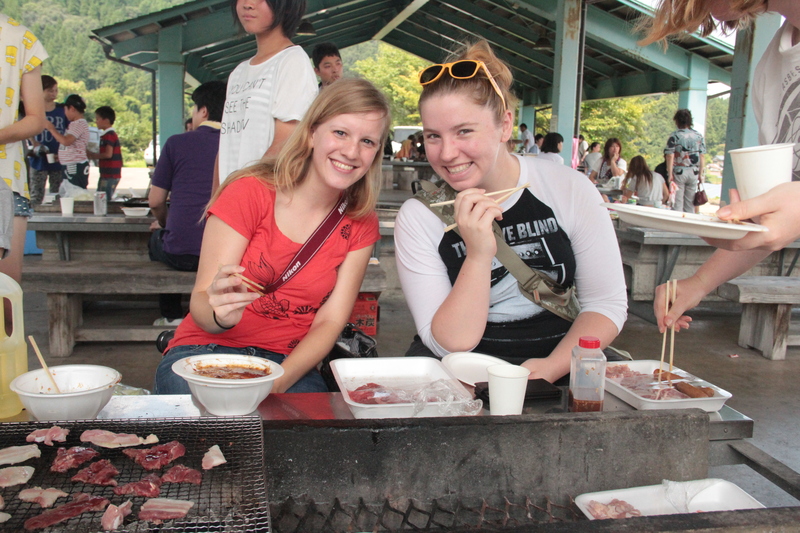 A couple spoke very fluent English and started to pass raw cuts of meat our way. They had what seemed like an unlimited supply and the most ultimate of awesome secret sauces produced from a local restaurant. I gorged myself, with the thin strips of beef, chicken, and pork taking almost no time to cook (it gives me wonder to how I was vegetarian for five years). On top of that we also had a couple of bowls of yakisoba, some sort of slow roasted pound-cake, and a prawn and rice dish served by this awesome guy who owned his own miso shop and spoke English perfectly from living in Toronto for three years. Before we left with promises of future events we said we’d be visiting his shop and I really hope that I can soon because he seemed like a sweet person to get to know and enjoy the area better. That night after much internal debate, I decided to join a party of ALTs in the area for karaoke. Initially I was on the fence because of last week’s hangover and an overall lack of sleep that I’d be getting this week. I knew I needed to get into a better sleep schedule in order to feel good for school, but I figured I should take the opportunities that are given to get out and not be stuck in the shell that is my apartment. In the end I had a good time, but we stayed out way past midnight. My Sunday started early with the hope of carpooling to Costco some 2 hours away. Alas, no one else woke up early enough to make the drive before I met my adviser at 2:00 to get his old college washing machine. Kind of bummed, but hey, I saved what was probably a lot of money, and I finally have a washing machine… well, I do have the washing machine, but I still have to figure out how to hook it up to the spigot without having water spray everywhere else. All in good time. First, I’ve gotta set my sights towards the first day of school. Posted in Karaoke, Weekend.Tagged interactions, weekend, work.